Turning Your Profession Into A PASSION 5 Tips to GET NEW CLIENTS Business Growth Hack: ABSORB YOUR CLIENTSâ&#x20AC;&#x2122; STRESS! Phone 888-461-3930 | Fax 310-751-7068 mag@topagentmagazine.com | www.topagentmagazine.com No portion of this issue may be reproduced in any manner whatsoever without prior consent of the publisher. 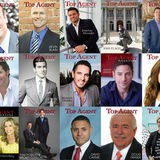 Top Agent Magazine is published by Feature Publications GA, Inc. Although precautions are taken to ensure the accuracy of published materials, Top Agent Magazine cannot be held responsible for opinions expressed or facts supplied by its authors. To subscribe or change address, send inquiry to mag@topagentmagazine.com. Published in the U.S.
your sleeves to relieve some of their grunt work, you’ll prove yourself invaluable. Think of yourself as the equivalent of an anti-anxiety pill to your clients. All you have to do is form a few easy habits. Laura and Raj, their agent and their loan officer soon came to learn that Laura’s 80-year-old mother may eventually move in with the family. This news not only helped the agent best meet Laura’s and Raj’s needs for a new home; it gave both the agent and the loan officer opportunities to go above and beyond for their clients. Their REALTOR® connected Laura with a senior services nonprofit near Laura’s mom’s current home that may be able to assist the family. And their loan officer outlined various, detailed options to Laura and Raj make smart, long-term financial decisions. Meanwhile, the agent and loan officer earned the trust of Laura and Raj, who felt less worried about the future. sellers know that they personally understand their needs and concerns will connect with clients quickly, break down barriers and help the process move smoothly. Chayan Alavi, Broker/Owner of Alavi Agency in Long Beach, California, challenges himself and his team to ensure that every action of every day serves others. “If we can put ourselves in other people’s shoes with empathy, then we become stellar professionals and great human beings, too,” he says. “I like knowing that we remove the sales pitch from real estate and make it all about the customer.” Chayan and his team focus on customer advocacy and building trust. But they don’t take trust for granted. Instead, they know trust must be earned and nurtured over time. mowed clients’ lawns, walked dogs and personally cleaned someone’s 8,000-squarefoot, $2 million home for a showing one day after his seller left the house. Two days before another closing, Matthew’s client was unable to move large amounts of unneeded furniture out of the house he sold. No problem! Matthew joined or created five online garage sales; sold or gave away most of the client’s belongings and had the remainder hauled away before cleaning in time for the closing. “The first time I sit with a seller on listing presentation or the first day I take someone on a buyer’s tour, they know I’m ‘all-in.’” Meanwhile, in the Cincinnati area, Aaron Denton of Summit Funding considers himself and his team members to be concierges for their borrowers. “We’re like personal assistants,” says Aaron. “People are happier when you remove the stress.” Included in their standard services are researching moving quotes; arranging and organizing movein day; scheduling utility transfers; assisting with children’s school registration paperwork; and even connecting buyers with local resources like daycares. If “rolling up your sleeves” isn’t your strongest skill, then an easy alternative is to get to know professionals in your area who can do these tasks for you. In the end, remember that by listening with patience, empathizing, and being willing to go the extra mile, you have the power to remove the stress your clients would experience without your help. When clients feel cared for, they remember the agents and partners who helped them. Shannon’s investor clients even trust her to buy a house for them sight unseen. When Shannon has a listing consultation, whether the property is a $100,000 condo or a million dollar home in Westfield, the first thing she emphasizes is that the home has to look fabulous online. She’s “politely honest” about what the sellers should do (rapid staging, painting, decluttering) or, if the house is empty, she’ll have it staged for them. She follows with professional photography, drone footage and a floor plan. She creates a virtual tour and Facebook Live tour. “Promoting to the correct audience is the most important thing,” she says, “and I can target the audience on Facebook. I also do brokers’ and public open houses, advertise in print and send Just Listed cards.” It’s all about people for Shannon, so she’s active in her community, particularly where her children are concerned. She’s been a Cub Scout leader, coached soccer and T-ball, is the class mom, and as a former science teacher, helped organize a STEM Night (science, technology, engineering, math) for families to come to school and work with robots, coding, etc. Down the road, she’d like to be on the Cranford Board of Education, but for now, when she’s not working, her life revolves around her family. She appreciates the flexibility real estate allows her. In the future, as Shannon “explodes” with her new team at RE/ MAX, she’ll focus on creating a bigger local presence. She’d like people to know her as a dynamic, successful Realtor, not just a teacher and mom. She was recently approved as an agent for HGTV’s “House Hunters” series, so she may soon gain not just a local but a national reputation! Special thanks to Voa Salon in Cranford - Hair; Kelly Cunningham - Makeup; and Denise Addona - Photography. 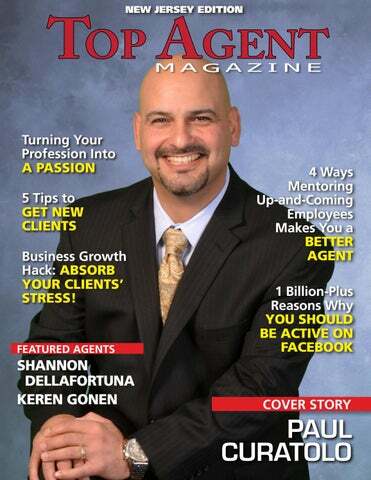 on being featured for the state of New Jersey in Top Agent Magazine! Michael Rible | Mortgage Loan Originator | NMLS# 1227749 Licensed in: NJ, NY, PA, & FL MLB Residential Lending LLC. | NMLS# 1188395 1095 Morris Avenue, Suite 104, Union, NJ 07083 C: 908-377-4769 | O: 908-312-5333 | F: 908-543-3540 E: mrible@mlbmortgage.com | mrible.mlbmortgage.com www. alternative. This helps older agents fine-tune their routines, while getting back in touch with the critical thinking that went into constructing those habits. Mentorships allows you to see the big picture. surely sharpen your ability as the head of a team. What’s more, you’ll be building skills of empathy, understanding, teaching, and constructive criticism. Working on those skills will better your practice and your ability to lead in your office. While some may balk at the time commitment or energy required to take on a mentee or two, you might consider it an act of ongoing education or professional development. While your mentee will undoubtedly benefit from access to your expertise, there’s certainly much to be gained from taking the time to cultivate tomorrow’s real estate leaders. KEREN GONEN People usually think of moving as a hurdle to overcome, a process rife with obstacles and headaches. But not those who work with Keren Gonen! Keren thinks of moving as an adventure and guides her clients through the process with dedication, enthusiasm and expertise. She’s committed to providing them the absolute best real estate experience possible. “It’s important to me to help my clients achieve the type of lifestyle they desire and require to lead a balanced and happy life,” she says. Keren knows how important that is. Born in Israel, she had to make a huge adjustment when she moved to this country in her early teens. She’s lived in Florida, California and New Jersey. After successful careers in the shipping and cosmetics industries, including owning her own business, she began helping her boyfriend, who owns a construction business, flip homes. At one point they became extremely frustrated with real estate agents who never returned their calls, texts or emails. Finally, her boyfriend suggested that she become an agent herself, so they wouldn’t have to deal with anyone else. She did—and to her surprise, she found the life she was seeking. An agent with the Green Team New Jersey Realty/Green Team Home Selling System, she’s licensed in both New Jersey and New York and serves all of the Garden State along with Warwick, New York. Although she’s been in real estate just over a year, in 2017 she closed an astounding 20 transactions, totaling $4.2 million in sales volume. She’ll become part of the Sussex County Board of Realtors Circle of Excellence, thanks to those numbers. Her broker calls her a shooting star. “He says if he can duplicate me, he’ll be a millionaire!” she says, laughing. But it’s not about the money. “I really care about my clients,” she says. “I’m attentive to detail. I respond quickly and I show up on time. I have their best interests at heart. It doesn’t matter whether they’re buying or selling, or whether it’s a $40,000 foreclosure or a $500,000 home, they all get the same type of dedicated service.” And that service doesn’t end when the transaction closes. Keren keeps in touch with past clients by email, text and phone, pops by to say hello, and sends gifts for holidays, birthdays and special occasions. The best part of the job for her is finding people a home that fits them. “People don’t usually know what they want,” she says. “You have to have the ability to listen closely and decipher what will actually make them happy.” Making people happy is where it’s at for Keren, which is why she gives back to the community whenever she can, volunteering at the Senior Citizens Center or supporting the Green Team “Light Up the Holidays” campaign. In her free time, the top priority is her children—and they’re probably all she has time for! Exceptionally goal oriented, she reads a lot and listens to podcasts that can help her grow her business. That’s just one of the reasons Keren does so well. She’s also open and willing to share what works for her. She feels that if everyone in her office does well, they’ll have so much positive energy that they can elevate each other, help each other’s business grow. Then nothing can stop them. As 2018 unfolds, Keren plans to continue helping more people and, when she’s in business long enough to get her broker’s license, open another branch of the Green Team. This “shooting star” will be lighting up the sky for some time. Count on it. visit greenteamhq.com/agent-news-and-awards/moreaboutkerengonen or zillow.com/profile/Keren-Gonen, call 551. 262.4062 or email Kgonen@greenteamhq.com www. and highlight all the great features. mit questions just like a real-life seminar. sider a tripod or other stabilizing tools, especially if you’re taking viewers on a tour of an open house. And check the shot before going live. lighting and avoid a lot of light directly behind you because it’ll wash you out. Sound	good:	A common mistake for beginners is overlooking sound. Consider an external microphone to make sure your viewers can actually hear you. And if the live option makes you a little nervous, you can also stream pre-recorded videos. Hey, that has worked like a charm for TV for decades. Some businesses promote their web series to “air” on Facebook Live at a certain time like TV shows. After they are streamed, Facebook Live videos function as normal Facebook videos. Some business owners believe videos may perform better if they begin as live ones. NowThis, a news company that publishes entirely on social platforms, experimented by streaming a 38-minute compilation of its favorite viral videos via Facebook Live. The stream received over 20,000 views and over 500 comments, according to Facebook’s counters. Yes, all the new-fangled internet tools, apps and options for REALTORS® can be a bit overwhelming. Just take it one step at a time and you’ll slowly be right there in the business-winning mix. E-mail me today at Article@CorcoranCoaching.com and I’ll send you more free information about how technology can help your real estate business. Copyright©, 2016 Bubba Mills. All rights reserved. mentoring new agents to find the success that he has. “I just want to keep getting bigger and better every year. I really found my passion. I came from a career that I did well in, but it wasn’t fulfilling for me. Now I’m doing something I truly love. I took a risk, and with hard work, I’ve made it happen. Everyone from mortgage lenders, to financial planners, to insurance agents, can be potentially lucrative referral partners for a Realtor®. You may already have great relationships with some that just need to be more formalized. But, you don’t just want to partner with anyone, make sure these are people you also feel completely comfortable referring your clients to - people who share your values and work ethic. Another avenue to consider is divorce attorneys – yes, you heard that correctly. Helping people go through this difficult period actually requires a very specific skill set. You need to be able to handle the legal aspects, as well as the emotional ones. There are numerous training courses you can take if you decide to take this route, which could end up being a lucrative and much-needed specialty. times be helping to facilitate dual transactions, as you try and secure a property at the same time you are helping your relocation client sell their previous home. This specialty is becoming an in-demand skill in areas that have major corporate headquarters. house for them. This is another way to show them the level of service they can expect from you. These clients might be harder to land, but the payoff will be enormous. One of the biggest hindrances of professional passion is falling into a rut. Routines are familiar and everyday responsibilities vie for our energy. But the next time you tackle a task the way that you always have, take a moment and try to refresh your perspective—is there a more clever or efficient way you could approach this project? Even better: why not take the plunge and do the things you’ve always been meaning to—throw that client appreciation event you’ve put off planning, take the continuing education course you keep forgetting to register for, even try a creative activity that pushes you out of your comfort zone. There’s no better way to inject some passion into your life than by going outside your bubble and taking a risk. Passion comes from all directions—from your own interior journey and from the world around you. To transform your profession into a passion worth having, invest in yourself and venture into the vast world around you. You’ll surely reap the rewards. Sometimes reinvigorating your passion for your work is about looking outward, rather than inward. Gain some perspective and consider who your work helps in the long run. As a real estate professional—whether you work as an agent, broker, in mortgages, home inspections, or otherwise—your work positively impacts someone else’s home-sweet-home. You make a difference. While it may seem like just another day at the office, taking a moment to visualize exactly who you are helping in the world at large is a great way to add some motivational fire to your daily tasks.